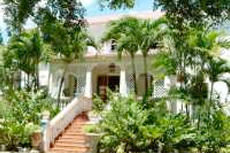 Sunbury Plantation House offers an elegant tour of the 18th and 19th centuries on a Barbadian sugar estate. This house features impressive antiques and a unique collection of horse-drawn carriages to give you a glimpse of Barbadian history. Wonderful trip to Sundbury Plantation. Wonderful trip to Sundbury Plantation. It is beautiful and well maintained and the rum tasting and cooking instruction were so fun. The three girls giving the cooking and drink making demo at Sunbury House really made the tour. Tour took us to a church and then to the plantation. We visited a plantation and were served tea, with scones, clotted cream, jams, little sandwiches and a selection of teas. We had a guided tour there and back. We booked the best of Barbados tour, which included Sunbury house. Part of farewell to Barbados Tour. Part of farewell to Barbados Tour. Food okay. More inforation on history of house would have been nice. Again, good guides. The rum recipes and samples were generous and the presenters were enjoying themselves as much as we were enjoying them. High marks! Gave tour around the island and last stop at sunbury House with lunch to spend dtime from getting off ship to airport for later afternoon flight. Very informative and enjoyed seeing other parts of island and lunch was very good. It was ok -- was part was rum drink tasting and the lunch. Rum tasting at the end was generous and fun. Rum tasting at the end was generous and fun. Also Orchid World which involves some uneven walking and signal station. We visited an old plantation that now has lots of antiques and a family still lives there. Excellent tour ... loved the rum punch which was offered. Home was lovely. Second time I took this tour (first with Princess). Second time I took this tour (first with Princess). Very enjoyable especially at the Botanical gardens with many orchids and sunbury is excellent. It is still a working sugar cane farm. They give you samples of Barbadon food and rum punch. Beautiful example of plantation living. Beautiful example of plantation living. Enjoyed it but again wish we had chosen the beach but it is a nice tour for people who are looking for something different & easy to do if the have mobility issues. When we arrived at the Plantation, I was not sure what to expect. Excellent guide and wonderfully alcoholic rum Punch demo!! A very enjoyable experience, where after going around the house we were treated to a demonstration of rum punch and cocktail making.There were plenty of tastings to be had. The Sunbury Planation House was very nice as well. Would not have visited there if it hadn&apos;t been on the tour.